The wall opposite my bed was totally blank, and as usual, I wasn’t sure what to put on it. I had been mulling over some ideas about picture frames and candle sconces, but nothing seemed quite right. Then one day, an idea struck me… I truly have no idea where it came from… that I should put a faux fireplace there. I perused Google and Pinterest, and I concluded that building a faux fireplace was within my skill set. I pinned a few inspiration pictures of what I wanted the fireplace to look like. After measuring the wall and deciding on dimensions, I began to contemplate how I would build the fireplace. I was assembling boards in my mind when suddenly I remembered I had this bathroom cabinet (which I had set aside after the frustration of two failed paint jobs). I began by rearranging some of the cabinet parts. 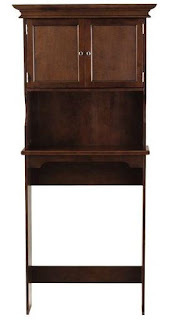 The thing was essentially two pieces – a top cabinet and shelf sitting on a bottom framework which functioned as legs. What I needed for the fireplace was mainly the bottom framework. First, I took the top off the framework and placed it on the bottom to serve as a sort of hearth. Next, I switched the back and front pieces, putting the smaller piece on the back and the larger piece on the front. 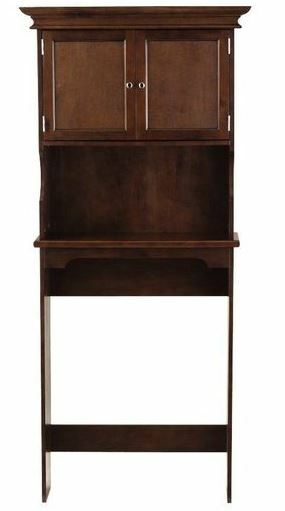 Then, I took the top from the cabinet and placed it on top of the framework to serve as a sort of mantel. I added two 1" x 2" boards to widen the facade. Then, it was time to add decoration and make this thing resemble a fireplace. I pulled all sorts of boards and wood trim up from my basement. I also brought in some decorative onlays and two balusters which I had purchased for about $1 at the reuse store. I played around with the bits and pieces until I got a look I was satisfied with. I put it all together with construction adhesive and a few screws. Then I painted the whole thing black. To make a back, I covered a board with "tin tile" style textured wallpaper and painted it black. I finished by adding candles and decor. That's really clever! I grew up in a house with multiple fire places, and I've always enjoyed having them, so I'm keeping this in mind for when I put more solid roots down somewhere. You're a DIY miracle worker. THIS is way more ingenius and useful than half the DIY hacks that you find on HGTV or the DIY network. I can't wait to see the finished project. You are truly gifted. Thank you! HGTV can be a bit redundant... basically variations on one of a few themes, such as distressing a piece of furniture or making a lamp out of a weird object. Wow. That is clever and looks awesome! Wow, you're so talented you seem to create masterpieces from anything. How did you see a fireplace in that old shelf? I'm so impressed with your work here! You truely are a DIY-goddess! This is looking amazing so far! I am in awe of your skills once more. Can't wait to see it finished and accessorized! You always create such lovely things, if you ever come to England please come and decorate my room! I have an armchair that was an amazing find, but needs someone who isn't useless with DIY!